But what if, after the first man left his print there, it became something more. What if the Moon became home? Pro Se Productions proudly releases PROJECT MOONBASE, a collection of pulpy tales all taking place in settlements, villages, and outposts on Earth’s Moon. From straight up science fiction to mystery to horror to mash-ups, this volume takes readers from their everyday sidewalks and busy streets and rockets them to the moon! Featuring tales by JC Crumpton, Kevin Findley, Neal Privett, John Holmes, and Aaron Bittner! With an exciting cover by Larry Nadolsky and logo design and print formatting by Marzia Marina and Antonino Lo Iacono, PROJECT MOONBASE is available now at Amazon at https://www.amazon.com/Project-Moonbase-J-C-Crumpton/dp/1546747265/ref=sr_1_5?ie=UTF8&qid=1495555289&sr=8-5&keywords=project+moonbase and Pro Se’s own store at www.prose-press.com for 15.00. 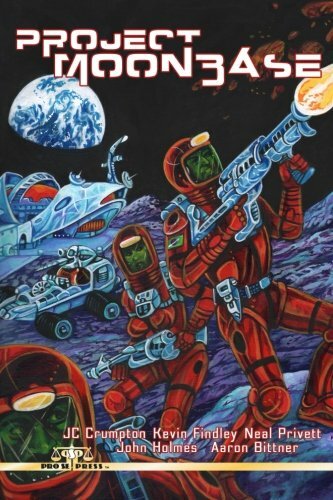 This out of this world collection is also available as an Ebook, designed and formatted by Lo Iacono and Marina for only $2.99 for the Kindle at https://www.amazon.com/Project-Moonbase-JC-Crumpton-ebook/dp/B071LHG1SG/ref=tmm_kin_swatch_0?_encoding=UTF8&qid=1495555289&sr=8-5 and for most digital formats via Smashwords at https://www.smashwords.com/books/view/724940. FOR IMMEDIATE RELEASE LIVING AND DYING BY THE BLADE-RICK NICHOLS’ ‘THE EASTLANDER CHRONICLES’ DEBUTS!